This fresh and flavourful appetizer is a great way to start a meal. Creamy avocado, mushrooms and onions are mixed with grapefruit for a simply sensational starter. Cut 2 avocados in half, removing pit; scoop out and chop flesh. Reserve shells. 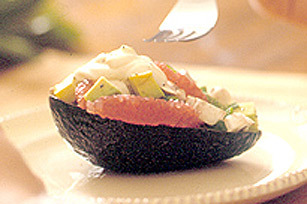 Mix avocado with 2 red grapefruits*, sectioned, a handful chopped mushrooms and a sliced green onion. Portion into avocado shells and serve with dollops of Miracle Whip Spread. *How to section a grapfruit: Slice ends off grapefruit and cut off rind. Slip knife in between fruit and section skin and remove fruit, leaving tough skin behind.